Action– The amount of cash wagered by placing money in a poker pot. Ante– This is a small period of a bet that each player must place into the pot before a new hand starts. Avatar– A 3D image of the player. Banker– The dealer or the player who books the other players’ action at the table. Bankroll– The amount of cash a player has to wager. Basic Strategy– When playing a game it is the set of plays a player uses to his/her advantage. Bet– Amount of cash wagered per spin or per hand. Betting Limits– The minimum and maximum amount of cash that’s wagered per bet. Bingo Marker– Ink dauber or crayon used to indicate the numbers on a bingo board. Blind Bet– Forced wager in pocket to start the pot. Bluff– Pretending to have a strong hand. Bump– To raise a player’s bet. Burn Card– A card that is temporarily removed from the deck after the deck has been shuffled and cut. Bust– When a player or the dealer’s hand in Blackjack is more than 21. Button- In poker, a small disc used to mark the dealer’s position. After each hand it is moved from player to player. Caller– In poker, a player that calls a bet. In bingo, it’s the player that chooses the game pattern, reads the number out aloud and draws each bingo ball. Card Counting– A technique used to keep track of the cards to increase the likelihood of winning. Chips– Token used in casinos that represent various denominations of cash. Colour Up– To exchange a smaller denomination of chips for larger ones. Combination Way Ticket– A keno ticket with which players bet groups of numbers in different combinations. Comps– Casinos reward loyal depositors with gifts or bonuses. It’s short for ”complimentary”. Croupier– The dealer at the baccarat and roulette. Cut– To divide the deck after a shuffle. Cut Card– A different coloured card used to cut the deck of cards. Deal- The distribution of cards to each player. Dealer Button– A small disk used in poker to indicate the current position of the dealer. Die– Dot numbered six-sided cube. Double Down– In blackjack, to double one’s original bet to receive a single card in return. Drop Box- On a gaming table, it’s the reservoir for cash, chips and markers. Even Money– A bet that pays the same amount as the wager. Expected Win Rate– The total amount of cash wagered a player expects to win or lose over a certain period. Face Cards– Any suite of Jack, Queen or King. Family Pot– When all players are involved in the pot. Fifth Street– In Hold’em poker, the fifth card on the table is known as Fifth Street. In Seven-Card Stud, fifth street is the third round of betting. First Base– At the blackjack table, it’s the position on the far left of the dealer. Fish– A novice poker player. Fishing– When a player stays in a hand hoping to land a specific card-not recommended. 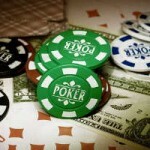 Flop– The first three cards dealt face up in Texas Hold’ Em. Flush– In poker, it’s five cards of the same suite. Four of a Kind– Four identical cards in the same hand. Fourth Street– In Texas Hold’em it is the fourth card on the table. In Seven card Stud, it’s the second round of betting. 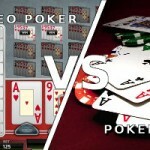 Full House– In poker, it’s a hand that comprises of three of a kind and a pair. High Roller– A player who wagers large sums of cash, also known as a ”whale”. Hit– To take another card when playing blackjack. Any hand valued at 11 that does not contain an Ace. Hole Card– Cards dealt face down at the table. Hot– A player experiencing a winning streak. Also used to describe a slot machine that offers regular payouts. House Edge– it is the percentage of each bet kept by the house. Insurance– A side bet offered in blackjack when the dealer’s up card is an Ace. The bet wins if the dealer has blackjack. Jackpot– The maximum win offered by a slot machine. Joker– A non-value card that acts as a wild card. Kicker– In poker, it is a high card that does not contribute to a straight or flush. Usually an Ace or a King. Load Up– The maximum amount of coins used on a slot or video poker machine. Loose: Refers to a slot machine that pays well. Marker– A cheque written at a gaming table by a player who has established credit with the casino. Mini-Baccarat– A less formal version of baccarat although the game is played with the same rules. Natural– In blackjack, a natural is when two cards total 21. In baccarat, it’s when two cards total 8 or 9. Number Pool– The numbers that a player can choose from in games such as keno and lottery. Odds– The probability of an outcome. Outside Bets– Bets located on the outside part of the roulette layout. Pair– Two cards of the same value. 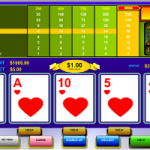 Payline– The lines on a slot machine to which symbols line up in order to win. Payout Percentage– The percentage of each dollar returned to a player in a game. Payout Table– A list that indicates the winning hand for the amount of coins or credits played on a slot or video poker machine. Pit Boss– The supervisor of all the games and casino personnel during a particular work shift. Progressive– A jackpot that increases as a result of a percentage of each bet. Push– A tie between the player and the dealer. Quads– A slang terms used for four of a kind. Raise– When a player increases a bet. Rake– The amount of cash a casino charges for each poker hand. It can be a percentage of the bet or a flat fee taken from the pot after each round of betting. Red-Black Bet– In roulette, an even-money bet on whether the next spin will be a black or a red number. River– It’s the final card dealt in Texas Hold’ em. Royal Flush- The highest hand in poker. It consists of a 10, J, Q, K and A of the same suite. Set– Three of a kind. Shoe– A box that contains multiple decks of cards for dealing. Showdown– In poker, it’s the last players remaining at the table. They must show their hands to determine a winner. Soft Hand– A blackjack term used to describe a hand that contains an Ace counted as 11. Stand– In blackjack, to refuse another card. Stickman– The craps dealer calling the numbers rolled and controls the stick. Straight– Sequentials cards in a game of poker. Straight Flush– Suited consecutive cards. Toke– A gratuity to the dealer. Vigorish– The commission charged by the casino. Wild Card– Any predetermined card that can be used as any other card to complete the hand. World Bet– A one-roll dice bet on the horn that includes a 7.